The Tennessee-Tombigbee Waterway Development Council was established in September 1984 by a resolution of the Tennessee-Tombigbee Waterway Development Authority. Advises the Tennessee-Tombigbee Waterway Development Authority, including the governors of compact states, as well as other entities, of actions needed to capitalize on the Tennessee-Tombigbee Waterway’s potential for economic development. Serves as liaison between the waterway’s commercial users, the United States Army Corps of Engineers, and the United States Coast Guard on matters affecting the operation and safety of the waterway. A permanent, standing committee meets regularly on these matters. Conducts studies and research related to the transportational and socioeconomic aspects of the Tennessee-Tombigbee Waterway, and provides a repository of information related to water transportation. 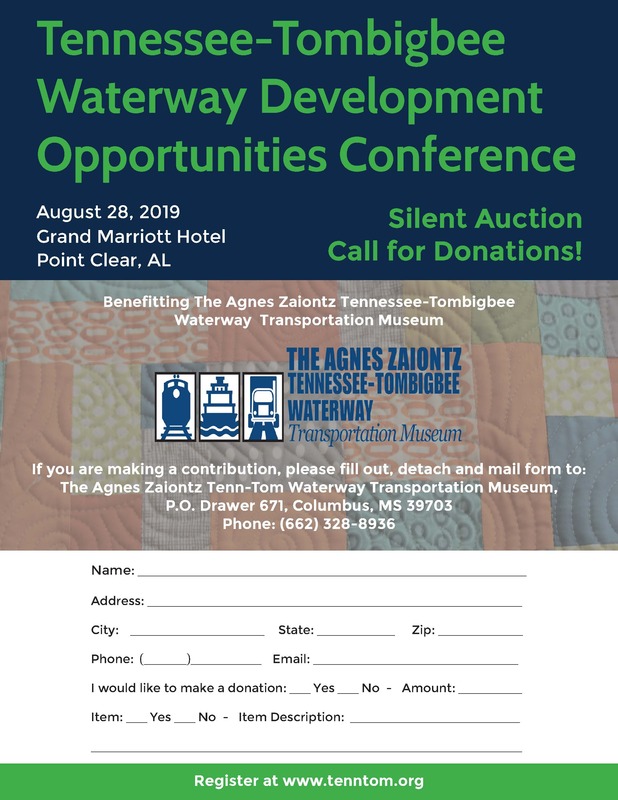 Helps provide better communication and understanding among the private business sector and federal, state and local government agencies and interests in the development of the Tennessee-Tombigbee Waterway Corridor. Assists affected states and private interests in promoting increased domestic and international trade. Compiles and disseminates information that will help inform individual states, counties, and companies of activities outside their jurisdiction, but which may affect their respective development plans. Provides coordination among public and private interests to ensure better utilization of limited resources available for development of the Tennessee-Tombigbee Waterway region. Conducts conferences, seminars, and other meetings on subjects of importance regarding the Tennessee-Tombigbee Waterway’s benefits, including recreation and tourism. It co-hosts an annual development opportunities conference, the region’s most popular waterway meeting. The non-profit organization is governed by an independent board of directors and officers elected by its membership. It has more than 200 dues paying members from some 12 states. The Council is composed of representatives of the private sector, states, counties, and local government, as well as other waterway interests. The Council represents commercial users in the operation and maintenance of the project and addresses research needs and technical matters that may impact its potential benefits. It advises public entities of action needed to capitalize on the waterway’s potential for development. The economic interests of its membership are far ranging, including industrial development, recreation, tourism, and trade.